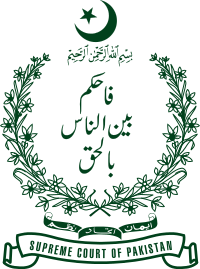 The Supreme Court (Urdu: عدالت عظمیٰ‎) (abbreviated as the SCP) is the apex court in Pakistan's judicial hierarchy, the final arbiter of legal and constitutional disputes. The Supreme Court has a permanent seat in Islamabad. It also has a number of Branch Registries in 4-5 major cities where cases are heard. It has a number of de jure powers which are outlined in the Constitution. Through several periods of military rule and constitutional suspensions, the court has also established itself as a de facto check on military power. In addition, it has also been active as a 'watchdog' in checking political corruption and abuse of power in recent times. This page was last changed on 28 July 2017, at 14:28.